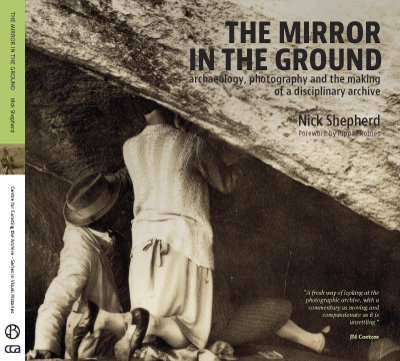 The Mirror in the Ground publication is a project by the Centre for Curating the Archive, and forms part of the Series in Visual History. Fragments and versions of these essays have appeared in a number of places. Versions of “The Grand Tour” and “Cleaning up the Stone Ages” appeared in the journal Kronos. A version of “When the hand that holds the trowel is black” appeared in the Journal of Social Archaeology. Versions of “What Mr Goodwin saw at the showgrounds” and “Oakhurst Cave” appeared in Archaeological Dialogues. None of the contents of this webdomain, or any of its subdomains and pages may be reproduced without the prior permission, in writing, of the copyright holders and the publisher. Mirrorintheground.com is a curated digital version of the book, and has been designed & developed, and is hosted by Niek de Greef. Any queries regarding this platform can be directed to Niek. Copyright for the contents of this website is vested in the copyright holders which are listed here. None of the contents of this webdomain, or any of its subdomains and pages may be reproduced without the prior permission of the copyright holders and the publisher.